Hey there crafty friends! Today I have some exciting news…. SumMore Fun asked me to be a Guest Designer this month, WOO-HOO (big smiley face). The card I’m shareing today is for their current mood board challenge. Using Mission Gold watercolors I painted the colors red and blue, as they are on the American Flag. 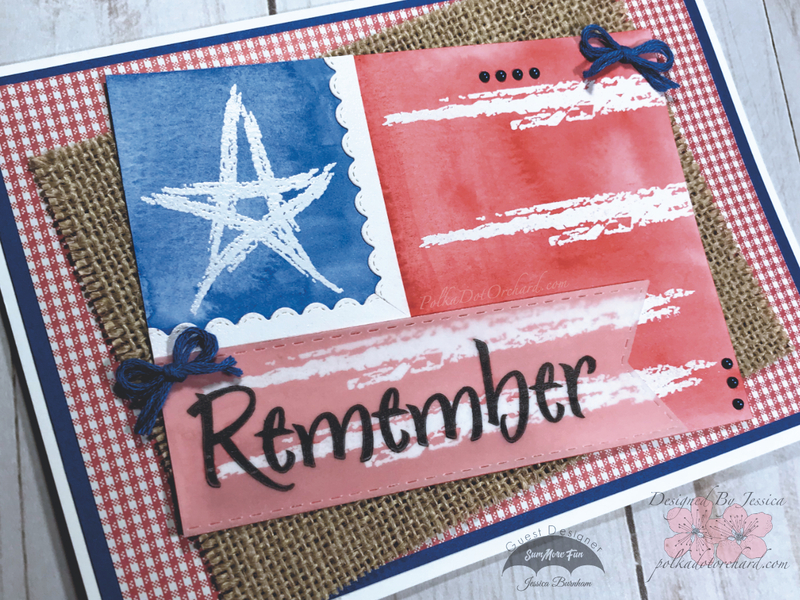 Then using the star and stripe stamps from the Raisin Boat stamp set “Strokes of Pride” I heat embossed the rest of my flag pattern. To heat emboss I stamped out my images using Versamark ink and then sprinkled Ranger white embossing power on it, finishing it up by using a heat gun to melt the powder. I didn’t like how the blue and red paint met so I decided to frame the star in using a stitched scalloped die. But first before cutting it, I used the same white embossing power used on the star and stripes to heat emboss a strip of paper. I did this because I wanted the whites to match. Now, the word “Remember” is also from the “Strokes of Pride” stamp set. I stamped this on some vellum using Stazon ink and then cut it out using a stitched banner die. To attach it to the card front I very carefully added small dots of Ranger Multi Medium Matte behind some of the letters, doing it this way hides the adhesive. After attaching all my layers I decided to add a little bit more to embellish the card a bit. I added two little blue blows that I made out of some embroidery floss and some mini flat back blue pearls. Now that the front is finished it time for me to coordinate the inside. I layered the same blue cardstock and red gingham pattern paper from the front on the inside. 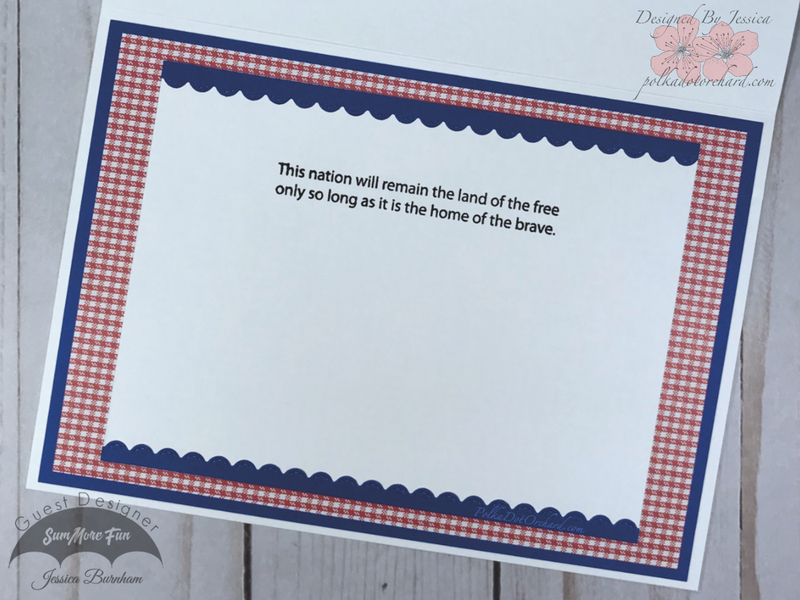 I then stamped the sentiment sentiment ” This nation will remain the land of the free only so long as it is the home of the brave.” onto white cardstock and added that on top of my pattern paper. To finish up the inside I cut some blue stitched scalloped borders and added them on top of my sentiment panel. The sentiment is from the “Strokes of Pride” stamp set. Ok, that’s enough about my card. 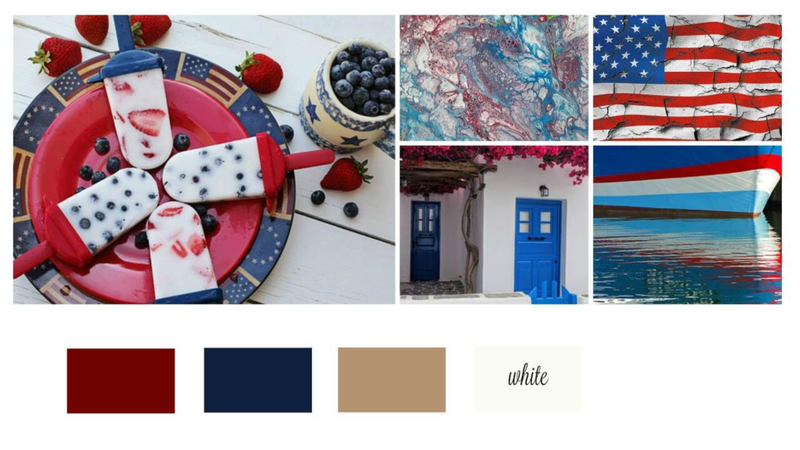 Check out this awesome mood board and let those creative juices flow. Great card! I love the patterned paper and burlap, such a fun a way to use the colors from the mood board. I’m so excited that you said yes to guest design for July and October. Thank you. 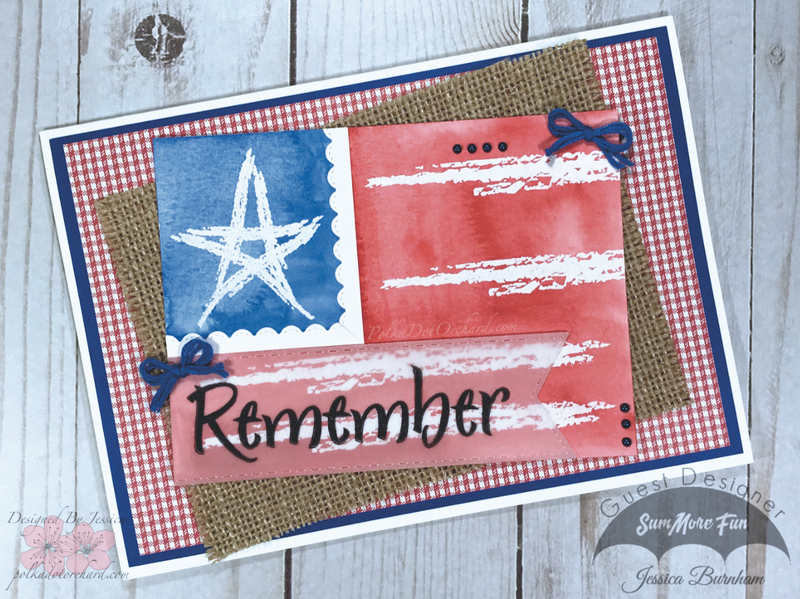 Your card is perfectly summer with the patriotic stamps, burlap and gingham. Awesome take on that mood board! Thanks for being guest designer at SumMore Fun! Wonderful Patriotic card Jessica! I love the burlap in the background! Congrats on being our Guest Designer This Month! We are so lucky to have you join us! Have a wonderful Weekend! Such a great card!!! The burlap really makes it pop! Love it!! Thanks for joining us and being our guest designer at SumMoreFun. Congrats! !